Whether you want to hike the Yorkshire three peaks, walk to the waterfall at Malham Cove, hop-skip-and-jump over limestone paving slabs or simply kick back in a good old Yorkshire pub, there’s plenty to do in the Yorkshire Dales National Park. It’s a rightfully protected landscape and a rightfully popular place for camping holidays too. The dales and moors here are awash with good camping and glamping sites, many of which are the sort of small, independent, farm locations that we love here at Cool Camping. Browse our short-listed collection of the very best campsites today and plan your next Yorkshire Dales adventure. Swaledale, Silverdale, Wensleydale and Ribblesdale… who wouldn’t want to explore such idyllic-sounding places? And the reality is every bit as enchanting as the vision. The Yorkshire Dales are full of babbling brooks, waterfalls, wildflower meadows and farms surrounded by drystone walls. But there’s a wilder side too with high moorlands, dramatic limestone cliffs and a network of caves and caverns in between those bucolic dales. All in all, it’s a paradise for outdoor lovers and therefore we can’t recommend camping and glamping in the Yorkshire Dales highly enough. The best campsites in the Yorkshire Dales National Park range from classic campsites with views that can’t be beaten to luxurious glamping sites with accommodation that has to be seen to be believed. Whether you’re planning a solo camping trip, a romantic glamping weekend or a family holiday in a campervan, you’ll find the Yorkshire Dales is a worthy place to head for. It’s a beautiful part of the country and camping and glamping really help to make the most of it. The national park covers some 840 square miles of countryside that live up to the Yorkshire of many people’s imaginations: green dales, clear-running streams, dry-stone walls and picturesque villages. It’s the perfect place for a holiday if you like walking, cycling, climbing and/or caving as there are plenty of opportunities for all. And, if you want a more relaxing time, that simply makes the most of the setting and sightseeing, camping or glamping are still the best ways to stay – in the humble opinion of our travel experts. 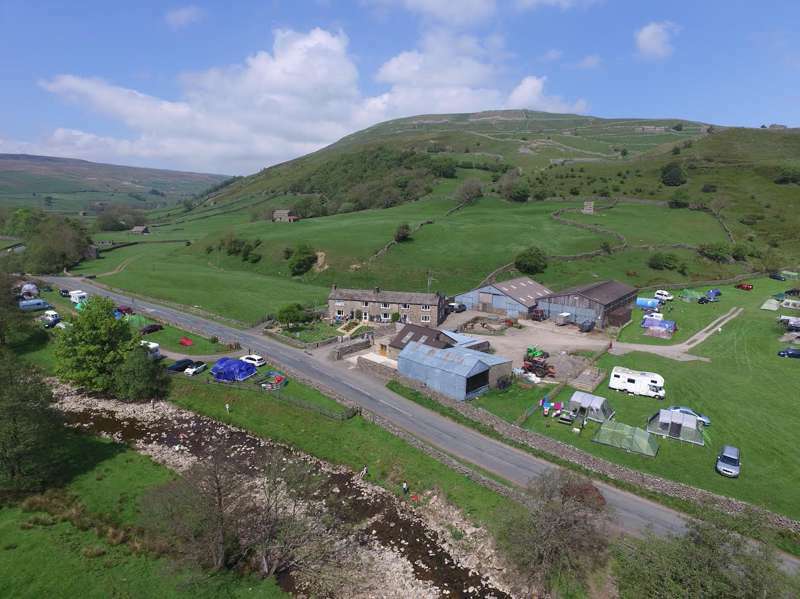 Our collection of campsites in the Yorkshire Dales National Park includes adults-only glamping sites, family-friendly campsites, places that welcome dogs, places within walking distance of a pub and plenty of pitches with beautiful views. 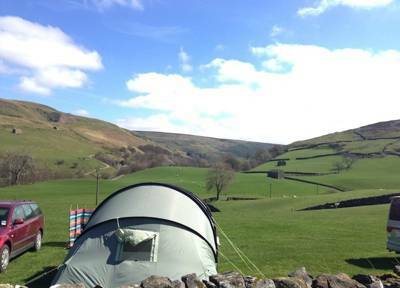 As one of the UK’s 15 national parks, the Yorkshire Dales is among the top places in the country to pitch a tent. The scenery of green dales, limestone peaks, rivers and streams can mean brilliant views from your campsite. And because the national park has a well-developed network of footpaths and cycle trails, it’s a great place for people who love to make the most of the great outdoors. Having been designated as a national park since 1954, classic camping is a time-honoured way to stay here. Many of the older campsites are simple set-ups in farmers’ fields that are close to classic walking routes or popular places to visit. The Pennine Way passes through the Yorkshire Dales, north-to-south, and the Coast-to-Coast route, made famous by guidebook writer Alfred Wainwright, crosses east-to-west. Both are popular linear routes often followed by long-distance walkers and backpackers who might be looking for places to pitch tents along the way. The Dales also attract challenge walkers and peak baggers who want to conquer Yorkshire’s Three Peaks (Pen-y-Ghent, Whernside and Ingleborough) as well as climbers and cavers looking to explore the above and below-ground limestone landscapes. These adventurers help ensure there is a steady demand for classic camping sites in areas that offer easy access to some of the best parts of the national park. You don’t have to rough it to enjoy the Dales on a camping holiday as there are classic campsites with great facilities among the Cool Camping collection and an ever-expanding range of glamping options too. 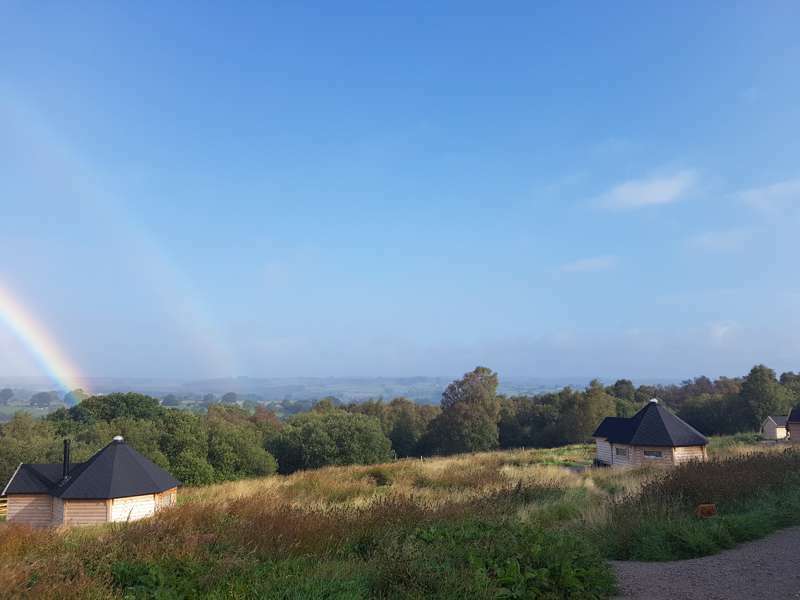 Bell tents, tipis, yurts and safari tents offer under-canvas glamping while pods, cabins, shepherds’ huts and gypsy wagons add a solid roof for yet more comfort. Some are simply kitted-out so you still feel like you’re camping (but don’t have to worry about pitching a tent) while others are like staying in a boutique hotel with easier access to the great outdoors. 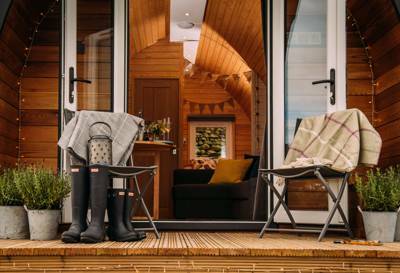 All of those featuring in our hand-picked collection have had the thumbs-up from our camping and glamping experts which means they offer something special – it might be an extra warm welcome from super-friendly hosts or it might be a hot tub on the veranda. Glamping in the Yorkshire Dales National Park is a great idea for campers who want a special treat, first-time campers and families who are divided in what they want from a holiday. Like camping, you are immersed in the great outdoors with the sights and sounds of nature all around but, to a greater or lesser extent – depending on the type of glamping you go for, you do not have to give up on the little luxuries that make it feel like you’re on holiday. Among its 800 square miles, the Yorkshire Dales National Park has bustling market towns, picturesque villages and sleepy hamlets. You might choose camping or glamping near town for the convenience and amenities that are brought within reach or you might prefer to pitch near a village or attraction that you particularly want to visit. You might like to be within walking distance of a shop, café or pub or you might prefer to be in the middle of nowhere with nothing but the sound of the birds and a babbling brook to disturb you. The market town of Skipton is known as a gateway into the national park as it’s situated just outside the boundary on the southern side. From here it’s a short distance to Bolton Abbey with its ruined priory, the popular town of Grassington and the village of Burnsall, all within Wharfedale. At the upper end of Wharfedale, the small market town of Kettlewell is another popular place to visit and stay at, as it's right on the Dales Way long-distance footpath. All fall within the Craven District of Yorkshire which also claims Malham, Ingleton and Horton-in-Ribblesdale. All three are small villages but attract visitors through their spectacular settings. Malham is close to some of the Dales most-visited scenery, Ingleton claims the best waterfalls and Horton-in-Ribblesdale some of the best walking as it sits at the foot of Pen-y-Ghent. The market town of Hawes offers a central location, visitor attractions, shops and access to the popular fells of Buttertubs and Fleet Moss. The villages and towns of Swaledale in the north part of the national park include picturesquely-located Reeth and Gunnerside. It’s a part of the park that’s wilder and the largest market town in the area is Richmond on its eastern edge. The Yorkshire Dales has its own popular Three Peaks Challenge; to walk up to the peaks of Pen-y-Ghent, Whernside and Ingleborough in 12 hours. It’s a 24-mile walk with more than 1,500-metres of ascent with competitors usually setting off from Ingleton, where you can ‘clock-in’ at the Pen-y-Ghent café. Other walking routes through the Yorkshire Dales include The Pennine Way, the Coast-to-Coast route and the Dales Way. These long-distance routes are only partly through the Yorkshire Dales but all offer a fantastic chance to see some of the national park’s finest scenery. Whether you’ve committed to taking on any of these routes end-to-end or are simply looking for a well-signposted footpath to follow on a shorter walk in the Dales, none of them will disappoint. If you prefer two wheels to a pair of walking boots, the Yorkshire Dales Cycle Way is the one for you. This 130-mile circular cycle trail should only be undertaken by experienced cyclists and takes, on average, six days to complete. A different kind of expertise is needed for caving and potholing which is also popular in the Yorkshire Dales and one of the most popular places to explore is the Three Counties System, the longest and most complicated cave system in Britain at 55 miles long. For climbers the limestone presents yet more opportunity overground with Malham Cove and neighbouring Gordale Scar attracting the climbing crowds. You don’t have to be an expert caver to go underground in the Dales as there are some spectacular showcaves which offer easier access to the subterranean world. 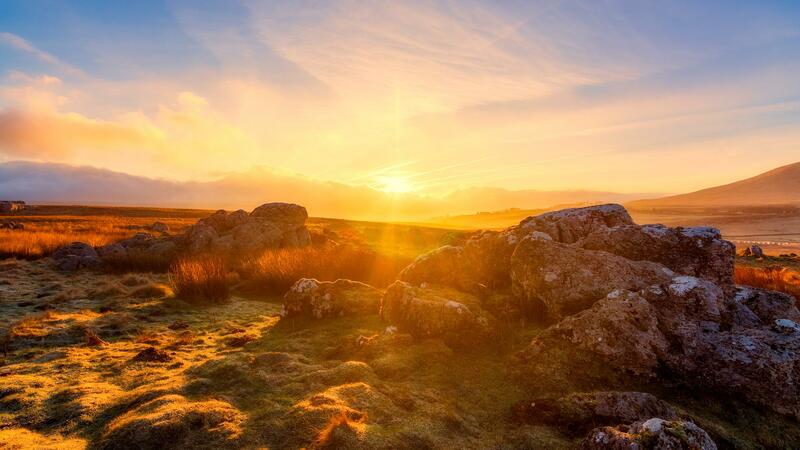 On the west side of the Dales, you can head to Ingleborough and White Scar Caves which are both open to the public. To find out the best way to see the overground limestone formations at Malham Cove and Gordale Scar as well as the popular Janet’s Foss waterfall, call in at the national park visitor centre in Malham. There’s no shortage of water and waterfalls in the Dales but another great place to go to see some of the best of them is the Ingleton Waterfalls Trail. While there’s no doubt that nature is the star of the show in the Yorkshire Dales, the Ribblehead Viaduct has been called its greatest manmade sight. This railway bridge supporting part of the Settle-to-Carlisle Railway has 24 arches and stands 100 feet over Ribblesdale. Taking a ride on the railway is another way to see the area and you can hop on board at Settle or Horton-in-Ribblesdale. The Embsay-Bolton Abbey Railway is another historic railway, this one operated only as a tourist attraction, that train buffs and families might want to get on board with. The Embsay end is not far from the charming market town of Skipton with the far-end near the ruined priory at the Bolton Abbey Estate that claims to offer Yorkshire’s best day out. The heart of the Dales offers another popular visitor attraction; the Wensleydale Creamery Visitor Centre where you can find out about the cheese-making in this part of the world and, maybe, buy some of your own. For more information on things to do in the area visit the Yorkshire Dales National Park website. North Yorkshire Dales National Park Cumbria Three Peaks Whernside Ingleborough Pen-y-Ghent ribble valley ribblesdale skipton kettlewell horton camping campsite campsites bolton abbey glamping glampsite glampsites tent tents campervan campervans caravans caravan park holiday holidays at Campsites in the Yorkshire Dales, Discover the best campsites in the Yorkshire Dales and pitch your tent in prime locations across the national park with this recommended collection from the Cool Camping team.